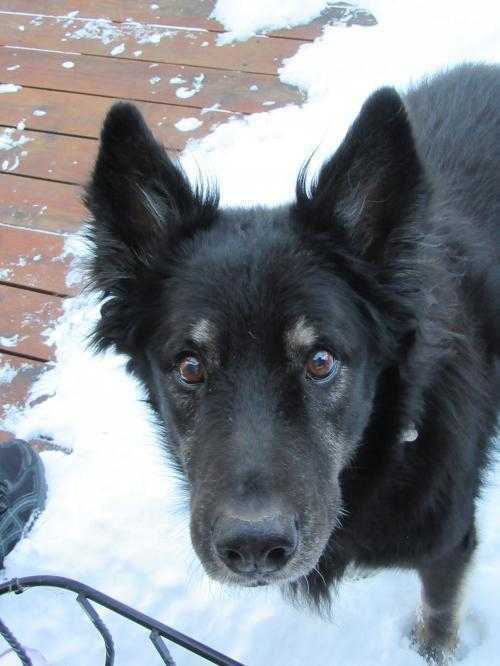 Creflo is a fabulous, affectionate 10 year old fluffy boy of about 50 pounds. He will give kisses and shake hands. In fact, he really loves to hold your hand while you sit and watch tv. Sleeping at your feet is one of his favorite things.... He loves company and would really like someone who is home a lot though he does well resting when you need to go out too. He has learned to enjoy gentle walks to the park and will stop to water every post and tree. Truth be told, he's pretty good at rationing pee for the return walk home too. A mile is about his limit. Creflo enjoys tug and chasing tennis balls. He has a particular gentle nibble for his squeak toys as he searches for the squeaker. Creflo wants you to know his absolute favorite toy is his “hedgie”. He has 3 and they are ALL his favorite toy. He loves treats, especially Blue Dog Bakery Softies. He will sit and hold his paw out for “Hello”. Creflo had one owner for his first ten years and never left home so he is still exceptionally scared of the car and very nervous going into new buildings. He has however gotten to really enjoy his walks and will wait at the gate if you pick up his leash. He has done extremely well with a home visit vet for booster shots. He likes to sleep on his bed next to your bed at night. He appreciates being tucked in with his blanket and frog and will mostly sleep through the night without needing to go out. If you get up, he will get up too. Please know: Creflo cannot do stairs and he is terrified of being picked up. He can mostly manage two stairs off a back deck but he has slipped going up which is likely why he is scared to do any other stairs. He does use a ramp in his foster home to get to the backyard. We think his back hips are weak and/or painful at times. He is on a Cosequin pill for joint health. Creflo does not like people grabbing his collar quickly or trying to pull him - he will react to that. He does VERY well if you try to direct him with treats instead of using his collar. The small dog in his foster home is too scared of big dogs to play, so we are not sure how well he will learn manners with other dogs. He is very interested in other dogs and shows playful signals rather than aggression, but again has not had the opportunity to spend time with other polite dogs to know. He loves to chase squirrels and would likely chase cats. His foster home has cats which he barks at, but because he can't do stairs he doesn't chase them. He responds quite well to the command “No Bark”.